We have known Ken for many years and have seen him smile but never as constant and as big as Saturday morning November 7, 2015…his first full time day at The Scuba Club. Ken is living his dream! He loves diving more than anyone we know and it shows as all he wants to do is get you as excited as he is about going underwater! 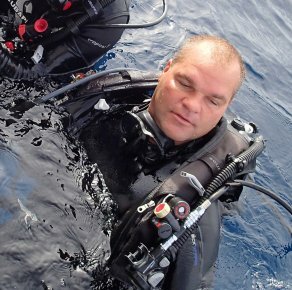 Ken is a PADI Master Instructor, EFR & Medic First Aid Instructor Trainer and can also certify you in just about any specialty such as Wreck, Deep, Search and Recovery, Night, Nitrox, Navigation, Dry Suit, AWARE Coral Reef Conservation to name just a few. Feel free to ask Ken about any specialty courses that interest you as he can pretty much teach them all and loves doing it. Ken is originally from Chicago and rumor has it he was a floor broker at the Chicago Mercantile Exchange. He has two sons in college and his wife and daughter are still in Chicago…for now.